Do werewolves smell of wet dog when they are in human form? Anna is having a tough week. After breaking up with her old pack she moves to the middle of nowhere with a guy/wolf – Charles – whom she has only just met. Then when a rogue wolf starts attacking people, she has to help Charles track it down before it exposes the pack. But is it really a wolf? 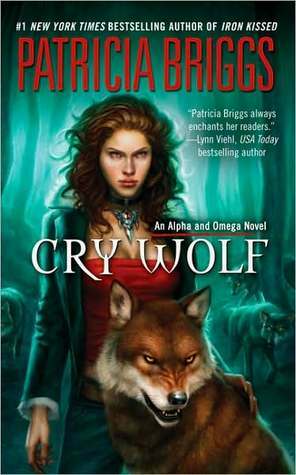 Cry Wolf is another werewolf series from Patricia Briggs set in the same universe as the Mercy Thompson series. After being won over by the Mercy series, I decided to give Alpha and Omega series a read. So I started with the Alpha and Omega novella and I am still scratching my head as to why it wasn’t just included as the first few chapters of this novel. If you intend on reading Cry Wolf, do read Alpha and Omega first. Or don’t: I’m not your mother. This was quite a hard book to rate/review. It was an enjoyable read, but the breaking of the story between the main novel and the introductory novella throws out the narrative a bit. The romance between an abuse survivor and a really old life-long bachelor as the central plot is interesting, but it does tend to wander as the other events of the novel occur. At times I felt the story was just happening with no real point or destination in mind, but it felt like things tied together in the end. And for a Patricia Briggs story set in the same universe as the Mercy Thompson series it is going to draw comparisons. Whilst I’d recommend this book (and novella), it isn’t as good as Mercy and her adventures. My recommendation is that you’ll enjoy reading this to sate your hunger for werewolf stories when you run out of Mercy Thompson novels to devour. Previous Previous post: Book vs Movie: The Crow – What’s the Difference?